In Spartanburg, S.C., Jobs Are Especially Scarce At 11.1 percent, South Carolina is tied for the fourth-highest unemployment rate in the country. Its small, conservative town of Spartanburg was hit hard in the past few years when the textile industry moved overseas. Now residents are seeking ways to make ends meet — from going to the food bank to getting their GEDs. 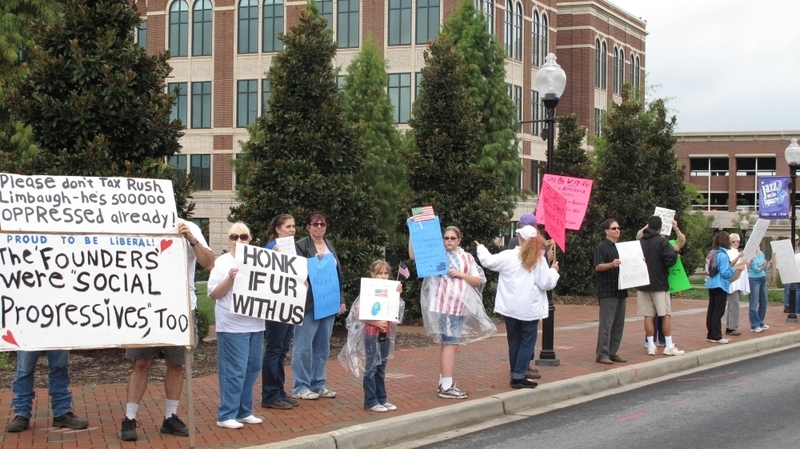 The Occupy Wall Street protests spread Thursday to Spartanburg, S.C. About 20 people got some honks of support and some catcalls from people who shouted, "Get a job!" The job market is barely treading water. The Labor Department Thursday reported that 404,000 people filed for unemployment benefits last week — pretty much unchanged from the week before. Overall, there are 14 million people looking for work in the U.S.
One of those places where jobs are especially hard to find is Spartanburg, S.C.
On Thursday, the Occupy Wall Street protests spread to the heavily conservative corner of the heavily conservative state. It was a small turnout — about 20 people got some honks of support and some catcalls from people who shouted, "Get a job!" Don Bramblett, an electrician, who is one of the 20, holds a fat black Sharpie to make a sign. "Especially in South Carolina — the very few hold on to all of the wealth," he says. "And the working class and the poor are getting less and less of the pie." South Carolina is tied for the fourth-highest unemployment rate in the country, at 11.1 percent. At a food pantry at the First Baptist Church Helping Ministries Center in Spartanburg, Sallie-Ruth Coleman prays during the morning devotion. 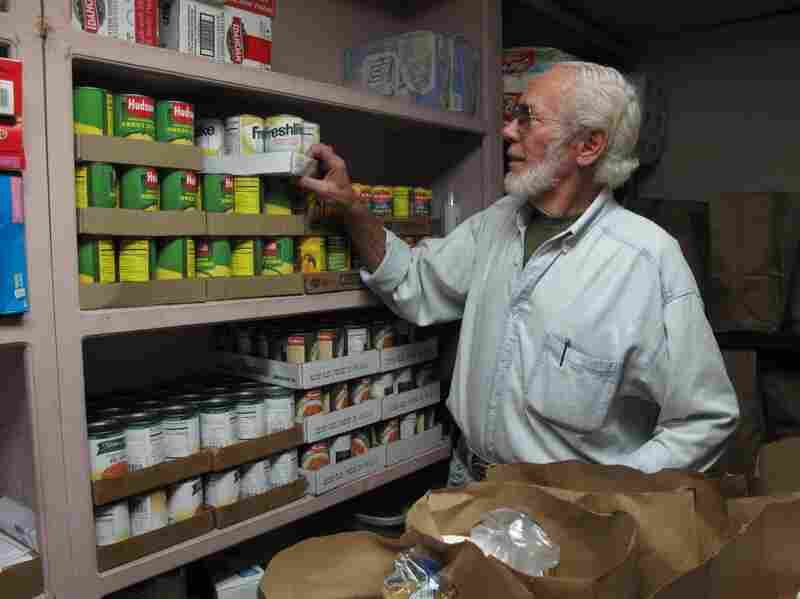 Volunteer Dean Ford prepares bags of food to be distributed at the First Baptist Spartanburg's food pantry program. "Dear Lord Jesus as we come to you today, we come to you with prayer and thanksgiving," she says. "I've got people in here that are hurting, Lord, and they may not even tell me about it, but they can tell you about it." Three mornings a week, the center opens its doors for people to pick up sacks of food or used clothing. And the numbers of people coming for help are soaring. Many, like Rocky Gist, 51, are unemployed. And he can tell you for exactly how long. "I've been outta work — the 23rd of this month will make two years," Gist says. Gist used to be a truck driver for a laundry company and he says he's been trying to find a job — anything. But he's had no luck. And his unemployment benefits ran out two weeks ago. This was his third time coming to the church to get food. "I never thought it'd be like this," he says. "Never thought it'd wind up like this. I hate that it had to come to this point. I really do. 'Cause I always have provided for myself, you know. I always have." In the end it was very repetitive — we went and saw people that looked like the same people at the last mill we covered and they had the same things to say. It was heartbreaking. The story of Spartanburg is the story of many cities throughout the South — cities that were built on the back of the textile industry and then watched that lifeblood disappear. Thousands of textile jobs were lost here as the industry moved overseas, the hulking factories now shuttered and crumbling. "The city is ringed with these places — shut down [mills] behind barbed wire," says Betsy Teter, who runs a nonprofit arts group in Spartanburg. "It's just part of the landscape here." On a tour of the old mills, Teter points out a bright spot — a mill that's been turned into apartments. Another mill was torn down and a brand new medical school has gone up in its place. Teter thinks back on her many years covering business for the Spartanburg Herald-Journal — at the height, or the depth, of the mill closures. "In the end, it was very repetitive — we went and saw people that looked like the same people at the last mill we covered and they had the same things to say," she says. "And it was heartbreaking. It was heartbreaking." 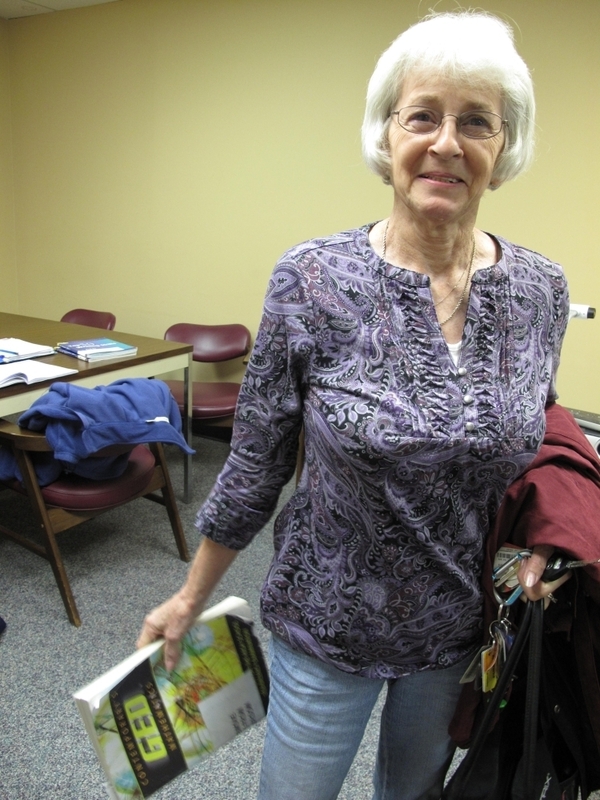 At the Adult Learning Center in Spartanburg, three seniors tell their stories. They all dropped out of school as teenagers and spent a lifetime working in the mills. Rosa Sherbert, 68, worked in textiles for about 30 years. Now she's studying to take the GED exam. Daisy Knuckles, 64, was laid off on March 3, 2009. "They took our work and moved it to China," she says. Rosa Sherbert, 68, worked in textiles for about 30 years. And Gene Ratliff, 73, was laid off on March 15, 2009. "It was hard to see the plant shut down and come to a standstill," he says. Now, they're bent over math books, studying fractions and geometry in preparation for the GED exam. They're hoping for a new start, late in life. And Ratliff says they know their odds of finding a job are even slimmer if they don't have a GED. "I told my wife I was going to Walmart to be a greeter," he says. "I've worked all of my life and sitting is not a job that I look forward to. This had been a challenge to me, coming to school, cause I've always been active, always working. And sitting here working this book is a challenge." Ten years ago, Spartanburg County had 36,000 manufacturing jobs. Now that's dwindled to 24,000. Many of them are in the automotive industry. Cooper Standard in Spartanburg makes sealing components for cars: the strips that keep out rain and noise. Human resources manager Warren Snead explains that state tax breaks helped the company expand this year after a dire stretch in 2009, when the auto industry was in the dumps. Two years ago, Cooper Standard filed for bankruptcy. Employees took a pay cut. There were layoffs. Ida Rodgers is an extruder technician at Cooper Standard. Two years ago, the company filed for bankruptcy, but with state tax breaks, it was able to expand this year. "What didn't kill us made us stronger," Snead says. "We're cautiously looking to the future — do we have confidence that the economy is strong? I can tell you, we could hire more people today if we had confidence that the economy was going to remain robust." And Snead says these jobs require different skills than the textile jobs of the past, and a high school diploma, at least. "It is now really a prerequisite," he says. "It's just not possible to go into this environment and not be able to read a gauge, or to read a screen, or to type commands into a computer." In Spartanburg, Cooper Standard has expanded its workforce this year — and one of its new employees is 23-year-old Quinton Varnadore, a machine operator. He's glad to have a job that pays $13.62 an hour. "I just bought my first house, just moved in last month," he says. "I love it. I love being on my own. I got a foreclosed house for half the price and I'm actually paying less to live in my own home than to live in an apartment right now." At first there was trouble trying to get his mortgage from Bank of America, but, Quinton says, "As soon as Warren Buffett bailed 'em out, boom! I got a house!"